a domestic disturbance: ¡La Fabrica del Taco! Found: Amazing tacos just a short 3-hour* drive from my house to Palermo Viejo. La Fabrica del Taco serves by far the best Mexican food that I've tried in Argentina. The decor is Mexican kitsch and the lighting is jaundice yellow...it just adds to the charm. Sure, I could spy on our table through a small keyhole from a stall in the ladies' room. So what? Better to keep an eye on all that guacamole. 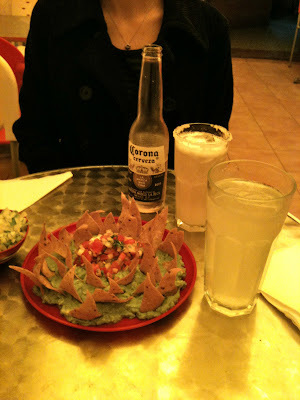 And the drinks are refreshing - we tried la limonada and la michelada. Reasonably priced considering the neighborhood: Guacamole with nachos and salsa (which included mango among its delicious ingredients) was AR$21. Cheeky, aren't they? Tacos are on the small side - I had a vegetarian taco with cheese ($15) and Guille had two of these multiple-meat tacos ($13 ea) that came with a fresh slice of pineapple. Road trip, anyone? ¡Andale Andale Arríba Arríba!